Once upon a time there was a little girl who loved birds. She picked up a pencil and started to draw...on paper, on napkins and paper towels, on the sidewalk, on fences, and occasionally on a wall or two....and never really stopped. 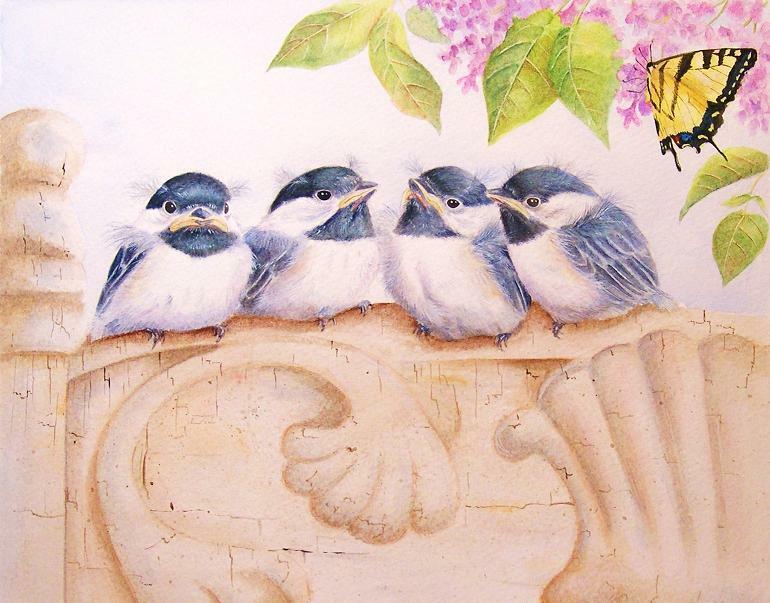 My name is Gail Savage, and I've been drawing and painting birds and animals my whole life. I live on a quiet 24 acres in the heart of the Blue Mountains of Pennsylvania, where inspiration is always just outside my studio windows. Our mountain is home to whitetail deer, foxes, black bears, coyotes, bobcats, wild turkeys, raccoons, and many smaller animals. The song of birds is a constant melody; woodpeckers, nuthatches, titmice, chickadees, wrens, thrushes, and all the colorful songbirds are abundant here. I am blessed to live in this peaceful place, and I'd like to share my world with you. I hope you will take some time to browse through my art gallery, and see what I see every day here in Savage Woods. I love to paint every detail of the world I know here in the mountains. The small surface and the delicacy required in painting feathers is a challenge; I work carefully with very small, soft brushes to achieve the depth and detail that I want in the artwork. What you will see here are the things I love the most in nature- birds and small animals. I also love to create art that commemorates important occasions like births, weddings, and anniversaries, and you will find this art in the "watercolor and pencil" pages and the "art for children" pages. Please email me for exact costs, to check on availability and for shipping charges. You can pay for your purchase easily and securely through PayPal or by personal check. If you are looking for that special Christmas gift, please order quickly as I am currently scheduled up until the end of November. You do not need to pay in advance for your work; just provide a contact telephone number and shipping address so I can schedule the necessary studio time. If you aren't sure what to get that special person in your life or time is running short, a gift certificate for art of his or her choice is a great solution. Nick, our pet Narragansett Turkey, donated lots of beautiful , naturally moulted feathers over the years. He died a peaceful death of old age. Please take a few minutes, relax, and enjoy a little slice of life here in Savage Woods. Just click on the arrow icon to enter my gallery.